The Blurb: Beautifully illustrated with many tips and advice on how to both understand, observe and even photograph the night sky, including the stars, galaxies, nebulae, Sun, Moon, asteroids, comets and planets from the back yard, this book is your essential guide and reference to the celestial wonders of the Southern Night Sky. 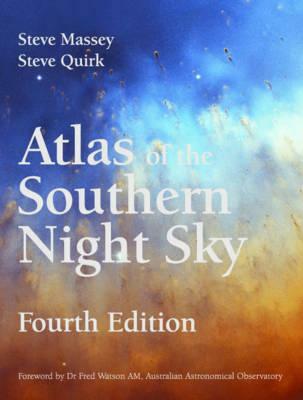 Atlas of the Southern Night Sky allows you to unlock the wonder of the cosmos with all the maps and photographs needed to guide you. This new edition is packed with useful information, including information on telescopes and other accessories, charts for navigating the features of the Moon, and instructions on how to observe the Sun and the planets. Atlas of the Southern Night Sky is a fascinating and educational book that provides stargazers with all they need to appreciate the wonders of the night sky.